This morning, I said a sad farewell to Tom and Jude as they went their separate ways. I spent the day touring various sites around Cape Town with four girls who had joined the trip in Victoria Falls. First, we visited the District Six Museum, which tells the fascinating but depressing story of the forced eviction of 60,000 of the area's minority residents during apartheid. Then we walked over to the Castle of Good Hope, a star-shaped fort built in the seventeenth century by the Dutch East India Company. 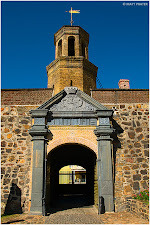 The fort served a variety of purposes over the centuries and is the oldest building in South Africa. We watched the changing of the guard and the ceremonial firing of the cannon, a ritual that takes place at noon every day. In the afternoon, we browsed the stalls at the large outdoor curio market in Greenmarket Square, where vendors sold souvenirs such as wooden masks, bracelets, and animal figures crafted of stone, wood, and beads. 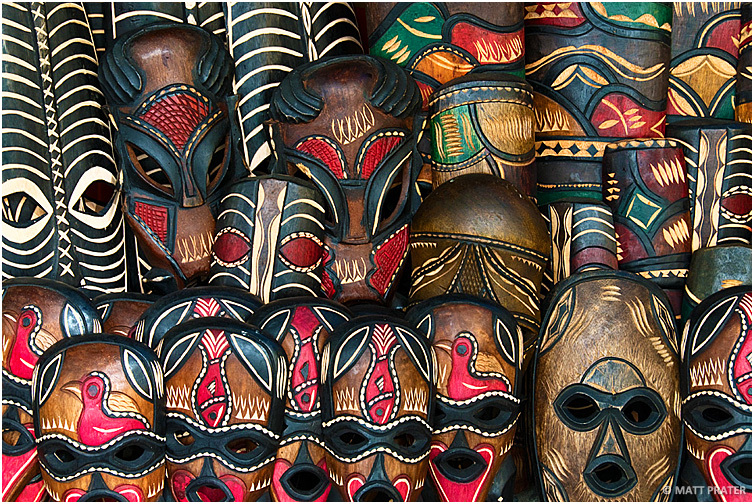 Many of these curios are the same as those I've seen throughout Africa, but they are often several times the price as they are likely imported from countries like Malawi or Tanzania. 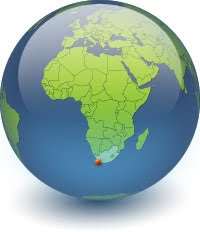 Although they are more expensive, I found most of the curios sold in South Africa to be of better quality than the cheaper wares sold by vendors in other countries, where it can take some time to sift through the junk to find a well-crafted souvenir. 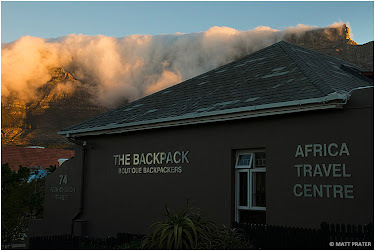 A blanket of cloud known as "The Tablecloth" flows off Table Mountain behind The Backpack hostel in Cape Town, South Africa. Finally, we headed to Kirstenbosch Gardens, part of a UNESCO World Heritage site that includes all the flora exclusive to the Cape region with its unique climate. Kirstenbosch Gardens is nestled against Table Mountain, which developed a thick blanket of cloud as we continued east towards the gardens. The climate can vary significantly depending on which side of the mountain you are on. The cloud layer that commonly floats just on the top of Table Mountain is know by locals as the "tablecloth", and it flows off the flat top of the mountain like a massive waterfall, dissipating halfway down. We walked around the gardens for a while, hiking along some of the trails that are lined with large patches of red or purple flowers. When the light faded, we caught a cab back to the hostel and enjoyed another fantastic dinner at one of the nearby restaurants.